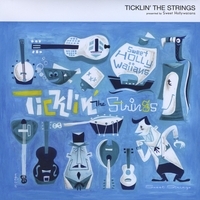 "Sweet Hollywaiians" are amazing Japanese hot string band and play '20s,'30s hawaiian,swing,ragtime,blues,italian and calypso music.... Hollywood style!! They respect the string virtuosos like Sol Hoopii,Roy Smeck,Eddie Lang,Carl Kress,Giovanni Vicari and play many many instruments......Guitar,Hawaiian Steel Guitar,Ukulele,Mandolin,Mandola,Banjo and Bass. When you listen to their sound,you will be really very impressed by their level of musicianship, clever arrangements and feel for playing the '20s,'30s music. "The Sweet Hollywaiians have probably the best feel for this 20's music of any string band working today. They manage the rare feat of sounding relaxed even when their playing is hot, are top notch musicians with tasteful arrangements and a full, rich, warm sound.Plus, they have a nice gamut of tunes, from King Nawahi to Giovanni Vicari to Bobby Leecan. See them live, if you can, for an unforgettable experience. If you can't, buy their Cds!" This group consistently puts out quality music that reminds you of a simpler time. With a stunning combination of Hawaiian music, old-timey gyspy jazz and calypso, all played on vintage instruments, this Japanese band isthe perfect storm of nostalgia, style, and most importantly – great music. Praised by acclaimed filmmaker Terry Zwigoff, this latest album features guest appearances from Robert Armstrong and Tony Marcus (from Robert Crumb and HIs Cheap Suit Serenaders).